For us, the huddled gambling masses, the dream and distraction of another glorious NFL season gets underway on Thursday night with the opening kickoff of the 2010’s first game. For the Minnesota Vikings it will be like being forced in Week 1 to march into the wasteland of some demented, demonic nightmare from 2009’s last game. The defending Super Bowl champion New Orleans Saints will begin their title defense at 8:30 p.m. on Thursday, Sept. 9 when they host Minnesota. This game was a rematch of the classic NFC Championship game played in the Superdome last January. The Saints won that game, 31-28, in overtime, aided by a stunning interception thrown by Brett Favre late in the fourth quarter with the Vikings on the cusp of a game-winning field goal. Had the Vikings won that game, in my opinion, they would have completely throttled Indianapolis in the Super Bowl. Minnesota was the best team in the league last year. But in that fateful trip to New Orleans they sabotaged any chance of a title with their erratic, mistake-prone play. They finished -4 in turnover margin, with two interceptions and three fumbles lost (they actually fumbled six times but recovered three of their own). Most bobbleheads that recap that championship match are quick to point out how much New Orleans pummeled Minnesota quarterback Brett Favre in the title game. And they did get some decent licks on Favre after he had gotten rid of the ball. But they didn’t sack him once and Minnesota pretty clearly outplayed the Saints. The Vikings outgained the Saints by more than 200 yards, outrushing New Orleans at a nearly 3-to-1 rate with Favre throwing for more than 100 more passing yards than Drew Brees. That said, New Orleans just has that magic in the Superdome. And with a rowdy crowd there to celebrate last year’s championship – just further twisting the knife into the Vikings – as well as cheer their team on to a key victory to start the year it’s a tall task to expect the Vikings to win this game. New Orleans is 12-3 in its last 15 home games and they are 11-7 against the spread in their last 18 at home. Both clubs will be missing some primary pieces from that title game when they rematch on Thursday. New Orleans will be without three defensive starters, including, Darren Sharper. Minnesota will be playing without stud receiver Sidney Rice as well as several other bit pieces from last year’s group. The main thing to remember about this season opening game is that these aren’t the same teams that met in January. A lot of the names are the same. But when they clashed in the postseason they were two powerhouse teams playing at a peak level. They were a pair of natural disasters colliding, each with the power and momentum of six months of devastation behind them. But this week they are simply two clubs trying to work through the rust, soreness, and cobwebs of a long offseason, hot summer and half-speed preseason. Neither team will be at their best and we shouldn’t expect a game anywhere near in scope of what we saw last January. New Orleans should be closer to form, playing with the focus of a defending champion after what has been a pretty sharp preseason. But Minnesota is still trying to get a hold of itself after more Favre drama, some injuries, and a muddled, stuttering exhibition season. The NFL started with the Thursday night opener back in 2002. The home team has gone 7-1 straight up and is 5-1-2 against the spread. However, Minnesota has covered five straight meetings, and four straight against the Saints covering the last six years. New Orleans has been established as a solid 4.5-point favorite in this one. The total has moved down from an open of 51.5 to a current total of 48.0. The Saints are taking two of every three bets on the side in this contest. 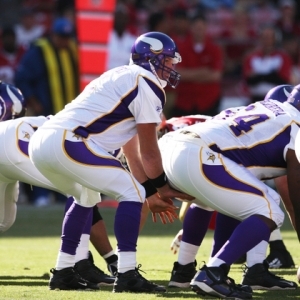 Vikings are 5-0 ATS in their last 5 meetings. ‘Over’ is 4-0 in the last 4 meetings in New Orleans. ‘Over’ is 5-0 in the last 5 meetings. Vikings are 4-0 ATS in their last 4 meetings in New Orleans. The situation I’m taking a long look at here is the total. This number has dropped three full points and I think with good reason. It is tough to bet ‘under’ against these two high-powered, pass-happy offenses. Especially because in two meetings over the past two seasons they have tallied 57 and 59 total points. However, the defense is generally ahead of the offense in the first couple weeks as the attacks try to find their rhythm and timing. For Minnesota, this is exacerbated by the fact that Favre hasn’t had a full camp with his mates and with his depleted receiving corps. Last season Favre was just 14-for-21 in his first game of the season, and that was against a hapless Browns team. The Vikings did ring up 34 points but the offense was out of sync for much of the contest. It’s really tough to bet the ‘under’ in any game with Brees, Favre and the Gang involved. But I think that’s the situation with the most value here. I think Minnesota’s defense will be up to the task and I think that offensively the Vikings are going to run the ball to protect Favre. This could be a sloppy game and while I think it will be played with a total in the 40’s I don’t think it will get to the 50’s.